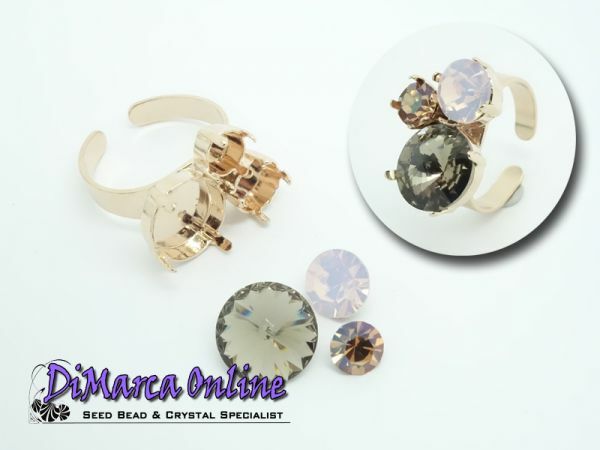 Ring Setting for 1 x 6 mm (SS29), 1 x 8 mm (SS39) and 1 x 12 mm Crystal Chatons and/or Rivoli's. The chatons and rivoli's can be set by bending the 4 prongs gently inwards with pliers. The back of the ring is open, so can be adjusted to your size. The ring setting is made of brass, with high quality thick nickel-free plating.